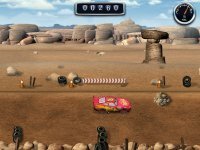 An activity center featuring the characters from the "Cars" movie in 10 different games. Not to be confused with the "Cars" PC game offered at Target, "Cars Radiator Springs Adventures" is an activity center for younger kids which offers 10 widely different games. While kids will race cars in this software, the racing controls have been simplified to accommodate younger players. In one race, kids simply move the mouse to change lanes and click it to jump over obstacles; and in another, the car moves forward whenever kids shift gears, which they do by clicking when a gauge moves into the green zone. While the 10 games are somewhat uneven in their difficulty, they tap into many different skills. Kids will use logic to rearrange parked cars and trucks in order to clear a path to exit the drive-in theatre. They will use their memory to help organize items in a shop. Other games test hand-eye coordination, and the ability to maneuver the computer mouse. One particularly challenging game is a takeoff of the "Snake" cell phone game. THQ markets this software for ages 4 and up, but these activities are too hard for kids that young. This software is a better fit for kids ages 7 and up who like a wide variety of arcade style games, but aren't looking for full-fledged racing.